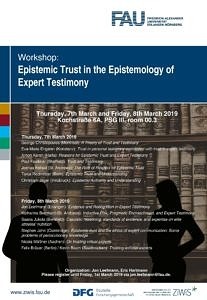 The workshop aims to further develop the concept of epistemic trust in the context of expert testimony and to investigate the relevance of trust-based accounts of testimony for explaining knowledge practices in scientific research and science communication. Katharina Bernhard (St. Andrews), Felix Bräuer (Berlin) and Kevin Baum (Saarbrücken) , George Christopoulos (Montreal), Eva-Maria Engelen (Konstanz), Saana Jukola (Bielefeld), Joshua Kellsal (St. Andrews), Arnon Keren (Haifa), Jon Leefmann (Erlangen), Nicola Mößner (Aachen), and Tanja Rechnitzer (Bern). The workshop will take place in Kochstraße 6A, Philosophisches Seminargebäude (PSG), room 0.03 PSG. Erlangen and Nuremberg both lie on major train routes and are served by long-distance ICE trains and regional trains. Timetables are available from Deutsche Bahn and the local public transport company, VGN.There are at least four regional train connections between Nuremberg Main Station and Erlangen every hour (S-Bahn in the direction of Bamberg or Forchheim; RE in the direction of Bamberg, Coburg, Jena, Leipzig or Saalfeld). All connections take about 20 minutes. Erlangen is accessible via the A73 highway (Frankenschnellweg). Underground trains run directly from Nuremberg airport to the center of Nuremberg, where there are connections to trains and the public transport network. There is also a direct bus connection between Nuremberg airport and the center of Erlangen (Hugenottenplatz). After arriving at the main train station (Erlangen Hauptbahnhof) leave the station building towards the city centre. Go straight on Universitätsstraße until you reach Lorlebergplatz. Turn left into Bismarckstraße. Follow the street and turn right into Hindenburgstraße. Turn right again and follow the little road. The venue is on the right side. Trust is widely regarded as a crucial element for managing the epistemic dependencies between scientific experts and non-experts. In practice, acquiring true belief through trusting another person’s say-so requires speakers to be trustworthy informants and hearers to adequately assess the speakers’ competence and sincerity, viz. their epistemic trustworthiness or reliability. On reflection, however, trust and trustworthiness are problematic concepts especially with regard to testimonial knowledge. Practical philosophy tends to construe trust as a kind of non-cognitive attitude that does not require believing that a trusted person will act as expected. These approaches explain well how trust differs from mere reliance and how it can serve various practical ends such as reducing complexity in action planning, coordinating joint actions or building trusting relationships. But when transferred to the context of testimonial knowledge they do not provide any straight-forward way to explain how trust in another person’s testified belief can be justified for epistemic reasons. In contrast, some epistemologists model epistemic trust as a special kind of belief. Some argue that truth-seeking hearers are rationally required to trust a speaker’s testimony if they have reasons to believe that the speaker is an authority on the matter in question. Others suggest that mutual interests of epistemic agents establish incentives for sharing or withholding information which make it reasonable to expect a speaker to tell the truth. These epistemological approaches are better suited for explaining why trust in another person’s testimony can be epistemically justified, but have difficulties explaining interpersonal and moral properties of trust and to distinguish trust from mere reliance. There is a limited number of slots available for submitted papers. Please submit your abstract to jon.leefmann@fau.de until December 23rd, 2018 and include ‘Workshop Submission’ in the subject line. Abstracts should be no longer than 600 words and outline the basic argument to be presented at the workshop. Authors will be informed about acceptance no later than January 14th, 2019.